Chlorella and spirulina are different species of algae that you can find in a number of dietary supplements. In Japan, chlorella, a single-celled phytoplankton, is also used as a food source. Although not backed by scientific evidence, chlorella and spirulina have several purported health benefits, including being an immune system stimulant and aid to digestion, as well as having some cancer-fighting properties. Chlorella and spirulina are also loaded with nutrients, such as vitamins C, B-12, beta-carotene, iron and zinc. But despite the possible benefits, these supplements do come with some potential harmful side effects. As algae, chlorella and spirulina are part of the plant kingdom, so it is possible to have an allergy to either one or both of them. An allergic reaction can manifest as redness, itching, hives, a skin rash and swelling of the face and mouth. It's also possible to suffer a more serious allergic reaction called anaphylaxis if you are highly allergic to chlorella or spirulina. Anaphylaxis is a medical emergency requiring immediate medical attention. Symptoms include wheezing, difficulty breathing and swallowing, confusion, fainting, loss of consciousness and even death in severe cases. Call your physician at the first sign of an allergy to chlorella or spirulina. It's essential to buy spirulina, and any other dietary supplements including chlorella, from a reputable manufacturer. If not processed correctly, spirulina can contain a high concentration of toxic substances called microcystins and anatoxin, according to Beth Israel Deaconess Medical Center. The maximum safe intake for these toxins have not been determined. These toxins may build up in your system and affect your liver and nervous system, especially if you are taking spirulina for an extended period of time. This is of particular concern for children, as spirulina is sometimes used as an alternative treatment for attention deficit disorder. Spirulina can also be contaminated with heavy metal toxins or with bacteria from animal fertilizer runoff. Chlorella and spirulina can interact negatively with certain medications. Because it contains vitamin K, chlorella supplements can interfere with the effectiveness of blood thinner medications. If you have an allergy to iodine, you may also be allergic to chlorella. Because of their immune-stimulating properties, do not take chlorella or spirulina with immune suppressing medications. If you have phenylketonuria, a genetic disorder in which your body cannot metabolize the amino acid phenylalanine, or an autoimmune disease, such as lupus or rheumatoid arthritis, you shouldn't use supplements containing spirulina. The supplements can worsen your symptoms associated with these conditions. Only use these dietary supplements under the supervision of your doctor, particularly if you are pregnant or breastfeeding. Although most side effects associated with spirulina and chlorella are not particularly harmful, they should still be taken into consideration. Chlorella can cause you to be over-sensitive to sunlight; it can also cause bloating, cramping and diarrhea. Spirulina can also produce some uncomfortable gastrointestinal effects, including diarrhea, nausea, vomiting, as well as insomnia and anxiety. Consult your doctor first if you decide to take these over-the-counter supplements, just to be safe. Is Spirulina Safe While Pregnant? How Much Spirulina Should I Consume? 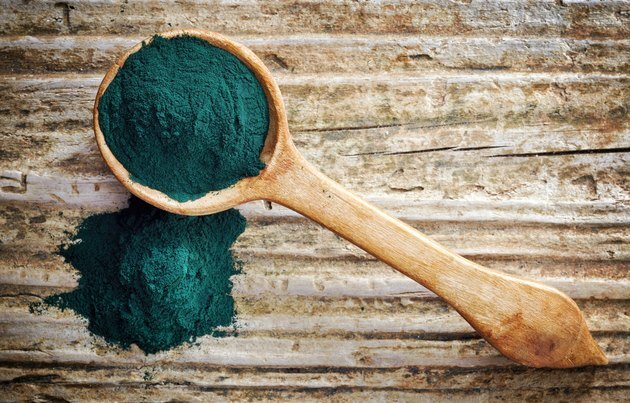 What Are the Benefits and Side Effects of Spirulina?